The video is about general CNC tips and techniques for King Plastic products. This video is about the King DuraStyle® Custom Cabinet Door Program, a CNC door and panel fabrication program designed to help cabinet makers and installers take advantage of exciting new business opportunities in the fast-growing residential, outdoor living category, and commercial markets, thanks to a super-tough polymer sheet stock called King StarBoard® ST.
More King Plastic Videos Available. King Plastic’s polymer sheets can be easily fabricated with a CNC machine. Tool manufacturers, such as Onsrud and Vortex, classify King Plastic’s material as ‘soft plastic’ in their catalogs and information. This is important because the geometry of the bit changes given the material it is intended to cut. Read King Plastic’s recommendations on CNC bits for plastic, how to achieve quality cuts, and how to reduce swirl marks in the CNC Quick Fact Sheet. 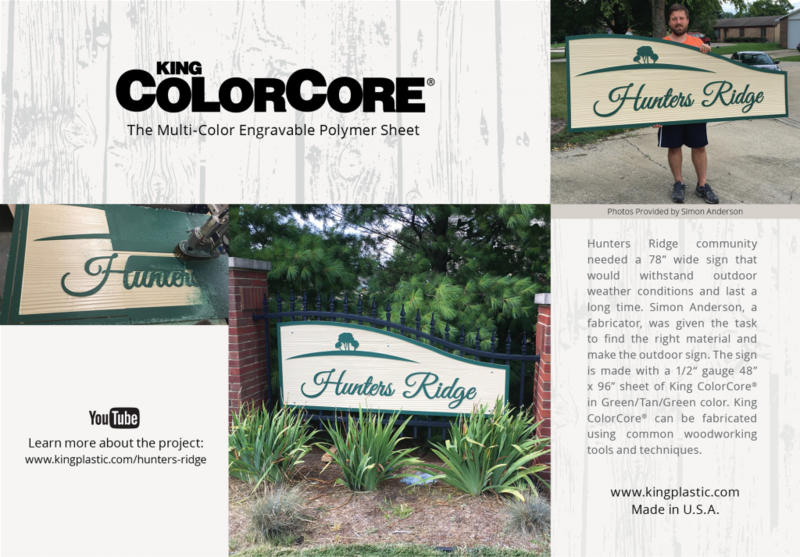 King Plastic Corporation’s polymer sheets work like wood and can be easily fabricated using standard woodworking tools. 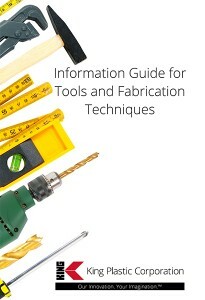 The new fabrication guide includes general tooling information, CNC guidelines, cleaning and general care information. King Plastic’s polymer sheets can be easily fabricated with a CNC machine. Tool manufacturers, such as Onsrud and Vortex, classify King Plastic’s material as ‘soft plastic’ in their catalogs and information. This is important because the geometry of the bit changes given the material it is intended to cut. 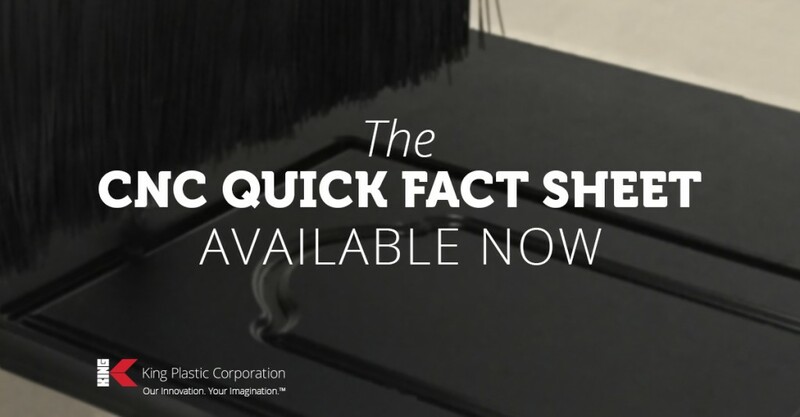 Read King Plastic’s recommendations on CNC bits for plastic, how to achieve quality cuts, and how to reduce swirl marks in the CNC Quick Fact Sheet, available now. The part to be bent needs to have a 90 degree groove routed in the material, which will form the finished bend location. The groove should be cut to a depth that leaves about 0.100”-.050” of material (more thickness for a rounder corner, less thickness for a sharper corner). Preheat the bending bar to a temperature of about 300 to 350 ºF when bending high density polyethylene. Adjust the temperature for other materials. Place the part on the bending bar and apply a weight of about 10 to 15 pounds per foot of the part being bent. For example, if bending a 24” part, a weight of 20 to 30 pounds needs to be applied to the part uniformly to hold the part down to the bending bar. This weight may need to be adjusted if the temperature of the bar is warmer or cooler, but the weight is needed to force the plastic in complete contact with the bar. The part needs to be in contact with the bar for 60 to 120 seconds depending on the temperature of the bar. 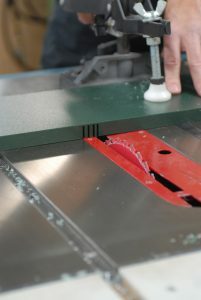 The best way to tell if the part is ready to be removed from the bar is to look for a bead forming under the part where the plastic meets the bar. When a small bead forms the full length of the part in this location on both sides, then it is ready to be removed. Pull the part off the bar by grabbing one end and pulling up, peeling the part off the bar while holding the bar down securely. The plastic will tend to stick to the bar, a small amount of molten plastic left on the bending bar is common. After the part is removed from the bar, immediately bend the part by placing it in a fixture or jig which will hold the part in its final position. It is important to hold the part in the jig for a minute or two to allow the molten plastic to cool. Allow enough time to complete the cooling. Sometimes the part will relax slightly after removing it from the jig and it may be required to over bend the part to get the final bend correct. Some experimentation may be necessary. 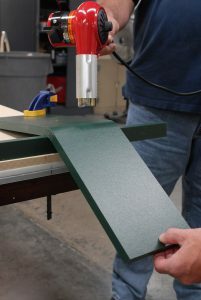 Forming a radius can also be done by using a heat gun, using a back and forth motion across the length of the sheet both top and bottom until the material is soft enough to start bending. Keep the gun at a distance of at least 8” to 12”, do not get the heat too close to the material as blistering may occur. Be aware, the thicker the material the longer it will take to form a desired radius, and scoring of the thicker material may be necessary. Once the material has been bent to the desired angle, clamp into place for at least 24 hours. By Vishu Shah, John Wiley & Sons. Failures arising from hasty material selection are not uncommon in plastics or any other industry. In an application that demands high-impact resistance, a high-impact material must be specified. If the material is to be used outdoors for a long period, an Ultraviolet resistant (UV) material must be specified. For proper material selection, careful planning, a thorough understanding of plastic materials, and reasonable prototype testing are required. Plastics are viscoelastic materials. Viscoelasticity is defined as the tendency of plastics to respond to stress as if they were are combination of elastic solids and viscous fluids. This property possessed by all plastics to some degree, dictates that while plastics have solid-like characteristics such as elasticity, strength, and form stability, they also have liquid-like characteristics such as flow depending on time, temperature, rate, and amount of loading. This also means that unlike metals, ceramics and other traditional materials, plastics do not exhibit a linear stress -strain relationship. Designers accustomed to working with metals and other materials often make the mistake of selecting and specifying incorrect plastic materials. It is this non-linear relationship for plastics that makes an understanding of creep, stress relaxation, and fatigue properties extremely important. Typically, for most designers the material selection process begins by reviewing the plastic material data sheets generally provided by the material suppliers. A misinterpretation of the data sheets is one of the most common reasons for selecting and specifying the wrong material, for a given application. First it is important to understand the purpose of a data sheet. Data sheets are useful only for comparing property values of different plastic materials such as the tensile strength of nylon versus polycarbonate or the impact strength of polystyrene versus ABS. Data sheets should be used for initial screenings of various materials. For example, if a designer is looking for a material that is strong and tough, he may start out by selecting materials whose reported values are higher than 7,000 psi tensile strength and impact strength values of better than 1.0 ft-lb/in and eliminating materials such as general purpose polystyrene, polypropylene, and polyethylene. Data sheets are never meant to be used for engineering design and final or ultimate material selections. First, the reported data is generally derived from the short term tests. Short term tests, as the name suggests, are the tests conducted without consideration of time, and the values derived are instantaneous. Tensile test, izod impact test, and Heat Distortion Temperature, are the examples of such short term tests. Data reported on data sheets are also derived from single point measurements. These tests do not take into account the effect of time, temperature, environment, and chemicals, etc. A single number representing one point on a stress-strain curve cannot begin to convey plastics’ behavior over a range of conditions. The standardized tests used to measure data sheet properties contain data measured in a laboratory under ideal conditions (as specified by ASTM or ISO standards) on standardized test specimens that bear little resemblance to the geometry of real-world parts. These tests likewise take place at temperatures, stress and strain rates that rarely corresponds to the real-world conditions. The proper use of multi-point data for selecting the most appropriate plastic materials for the applications cannot be over emphasized. This point is well illustrated in a classic example of misinterpretation of published test data and the true meaning and usefulness of Heat Distortion Temperature (HDT) values. The Heat Distortion Temperature test is a short-term test conducted using standard test bars and laboratory conditions. The temperature values derived from this test for a particular plastic material is simply an indication of the temperature at which the test bar shall deform .010 in. under a specified load. The reported values are further distorted by factors such as residual stresses in the test bars, amount of load, and specimen thickness. This reported value is of limited practical importance and should not be used to select materials for applications requiring continuous exposure at elevated temperatures. Continuous use temperature data such as UL temperature index is a better indication of how plastic materials will perform for extended period at elevated temperatures. If a designer were to select the material solely based on published heat deflection temperature data without understanding the true meaning of the test, test limitations and how the values are derived, the result could be disastrous. As discussed, material selection difficulties stem from limited availability of multi-point data from the material suppliers. Data sheets with single-point measurement data are readily available. However, with a little effort, the designers can find multi-point data from the sources such as CAMPUS (2) and IDES (3) and from all leading material suppliers. Multi-point data is presented in the form of chart and graphs of shear modulus versus temperature, isochronous stress-strain curves, and creep data at a minimum of three different temperatures and four stress levels. While designing a product to withstand multiple impact loads, the designer must take into consideration the data generated from instrumented impact tests which can provide valuable information such as ductile to brittle transition and behavior of the specimen during the entire impact event. Modulus values are also often misinterpreted. The flexural modulus values which are derived from single-point measurement are frequently accepted as the indication of the stiffness of the material over a long period. Flexural modulus tests are conducted at a very low strain and generally represent only the linear portion of the stress-strain curve. The reported values do not correspond well with the actual use conditions and they tend to over predict the stiffness of the actual part. Plastic parts often fail due to the lack of consideration of creep values in material selection process. Plastics can creep or deform under a very small load at a very low strain, even at room temperature. Creep or apparent modulus data for the plastic materials over a long period at several temperatures should be evaluated. The material selection should not be solely based on cost. A systematic approach to material selection process is necessary in order to select the best material for any application. The proper material selection technique involves carefully defining the application requirement in terms of mechanical, thermal, environmental, electrical and chemical properties. In many instances, it makes sense to design a thinner wall part taking advantage of the stiffness-to-weight ratio offered by higher-priced, fast cycling engineering materials. Many companies including material suppliers have developed software to assist in material selection simply by selecting application requirement in the order of importance. Material selection process starts with carefully defining the requirements and narrowing down the choices by the process of elimination. Designer must identify application requirements including mechanical, thermal, environmental and chemical. All special needs such as outdoor UV exposure, light transmission, fatigue, creep, stress relaxation, and regulatory requirements must be considered. Processing techniques and assembly methods play a key role in selecting appropriate material and should be given consideration. Many plastics materials are susceptible to chemical attack and therefore behavior of plastics material in chemical environment is one of the most important considerations in selecting material. No single property defines material’s ability to perform in a given chemical environment and factors such as external or molded-in stresses, length of exposure, temperature, chemical concentration etc. should be carefully scrutinized. Some of the common pitfalls in material selection process are relying on published material property data, misinterpretation of data sheets and blindly accepting material supplier’s recommendations. Material property data sheets should only be used for screening various types and grades of materials and not for ultimate selection or engineering design. As discussed earlier, the reported data is generally derived from short term tests and single point measurements under laboratory condition using standard test bars. The published values are generally higher and do not correlate well with actual use conditions. Such data does not take into account the effect of time, temperature, environment and chemicals. Both short and long term property date must be evaluated; Short term data for quick comparison and screening of the candidates and long term data for final material selection. Creep and stress relaxation data which represents deformation under load over a long period needs to be scrutinized over the usable range of temperatures. Isochronous stress-strain curves are very useful for comparing different materials on equal time basis. Multi-point impact data obtained from instrumented impact test which provide more meaningful information such as energy at a given strain or total energy at break must be taken into account. Plastic parts often fail due to the lack of consideration of sudden loss of impact in a very cold environment. Multi-point low temperature impact data, although generally not found on data sheets, is available from all major material suppliers. As discussed earlier in the chapter short term values such as heat distortion temperature, Vicat softening point should only be used for initial screening. Meaningful values derived from continuous use temperature and co-efficient of thermal expansion test are more helpful for final material selection. Plastic materials tend to expand and contract anywhere from seven to ten times more than conventional materials like metals, wood and ceramics. Designers must be well aware of this and special consideration must be given if dissimilar materials are to be assembled. The thermal expansion differences can develop internal stresses from push-pull effect along with internal stresses and cause the parts to fail prematurely. The restraining of the tendency of a piping system to expand/contract can result in significant stress reactions in pipe and fittings, or between the piping and its supporting structure. The allowing of a moderate change in length of an installed piping system as a consequence of a temperature change is generally beneficial, regardless of the piping material, in that it tends to reduce and redistribute the stresses that are generated should the tendency for a dimensional change be fully restrained. Thus, allowing controlled expansion/contraction to take place in one part of a piping system is an accepted means to prevent added stresses to rise to levels in other parts of the system that could compromise the performance of, or cause damage to the structural integrity of a piping component, or to the structure which supports the piping. One of the most important considerations in selecting the right material is it’s resistance to various chemicals. As discussed earlier, the resistance of plastics to various chemicals is dependent on time of contact with chemicals, temperature, molded-in or external stress, and concentration of the chemical. Part design and processing practices play a major role in material’s ability to withstand chemical attack. For example, stress concentration factor increases significantly for the parts designed with radius to wall thickness ratio of less that 0.4. As a rule, crystalline polymers are more resistant to chemicals when compared to amorphous polymers (and therefore if the application requires the parts to be constantly exposed to chemicals, crystalline materials should be given serious consideration. Plastic materials are sensitive to environmental conditions. Environmental considerations include exposure to UV, IR, X-ray, high humidity, weather extremes, pollution from industrial chemicals, micro-organisms, bacteria, fungus, and mold. The combined effect of various factors may be much more severe than any single factor and the degradation process in accelerated many times. It is very important to understand that the published test results do not include synergistic effects of various environmental factors, which almost always exist is real life situations. Designers should consider exposing fabricated parts to environmental extremes much similar to the ones encountered during the actual use of the product. Material selection maybe driven by the regulatory requirements put forth by agencies such as Underwriters Laboratories (UL), National Sanitation Foundation (NSF), Food and Drug Administration (FDA) in terms of flammability, pressure ratings, and toxicological considerations. As discussed earlier, material selection should not be driven by cost alone. The most logical approach calls for choosing 3 to 4 top candidates based on requirements and select one of them with economic considerations. Material selection process must also address processing considerations such as type of fabrication process, secondary operations, and component assembly. Ask about our 3-Part Specification Guide for Architects. Welding is the process of uniting sur­faces by softening them with heat. When welding thermoplastics, one of the key components is the material itself. For as long as plastic welding has been around many people still do not understand the basics, which is critical to a proper weld. The number one rule of welding thermoplas­tics is you must weld like-plastic to like-plastic. In order to get a strong, consis­tent weld, it is necessary to make sure your substrate and your welding rod are identical; for instance, polypropylene to polypropylene, polyurethane to polyurethane, or polyethylene to polyethylene. Here are some tips for welding differ­ent types of plastics and steps to ensure a proper weld. Polypropylene (PP) is one of the easiest thermoplastics to weld and is used for many different applications. PP has excellent chemical resistance, low spe­cific gravity, high tensile strength and is the most dimensionally stable poly­olefin. Proven applications using PP are plating equipment, tanks, ductwork, etch­ers, fume hoods, scrubbers and orthope­dics. In order to weld PP, the welder needs to be set at approximately 572°F/300°C; determining your temperature will depend on which type of welder you pur­chase and the recommendations from the manufacturer. When using a thermo­plastic welder with a 500 watt 120 volt heating element, the air regulator should be set at approximately 5 p.s.i. and the rheostat at 5. By doing these steps, you should be in the vicinity of 572°F/300°C. Another fairly easy thermoplastic to weld is polyethylene (PE). Polyethylene is impact resistance, has exceptional abra­sion resistance, high tensile strength, is machinable and has low water absorp­tion. Proven applications for PE are bins and liners, tanks, laboratory vessels, cut­ting boards and slides. The most important rule about weld­ing polyethylene is that you can weld low to high but not high to low. Meaning, you can weld low density polyethyl­ene (LDPE) welding rod to high density polyethylene (HDPE) sheet but not vice versa. The reason being is quite simple. The higher the density the more difficult it is to break down the components to weld. If the components cannot be bro­ken down at the same rate then they can­not join together properly. 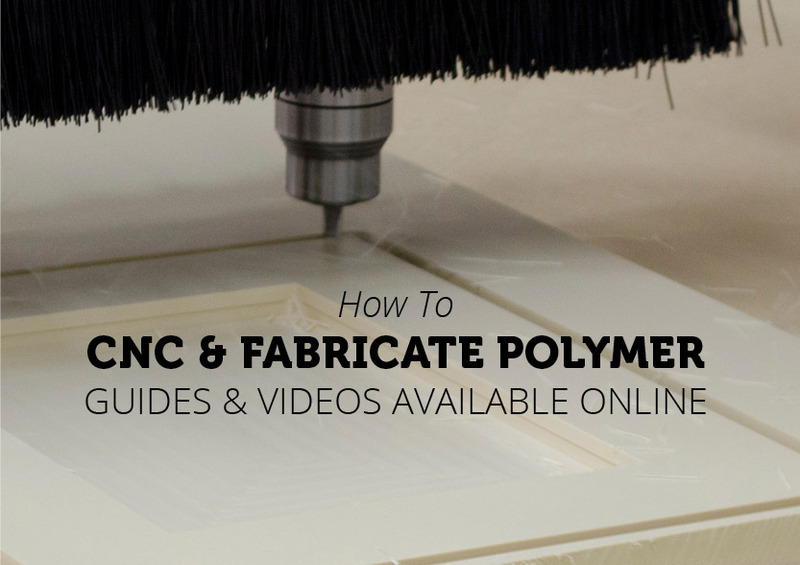 Other than making sure your densities are compat­ible, polyethylene is a pretty easy plastic to weld. To weld LDPE you need to have the temperature at approximately 518°F/ 270°C, the regulator set at approximately 5-1/4 to 5-1/2 and the rheostat at 5. Like PP, HDPE is weldable at 572°F/300°C. Prior to welding thermoplastics, there are a few simple steps that need to be taken to ensure a proper weld. Clean all surfaces, including the welding rod, with MEK or a similar solvent. Groove the substrate large enough to accept the welding rod and then cut the end of the welding rod to a 45° angle. Once the welder has adjusted to the proper tem­perature, you need to prep the substrate and the welding rod. By using an auto­matic speed tip a lot of the prep work is done for you. Holding the welder about an inch above the substrate, insert the welding rod in the tip and move it in an up and down motion three to four times. Doing this will heat the welding rod while heating the substrate. An indication the substrate is ready to be welded is when it starts getting a fogging effect — similar to blowing on a piece of glass. Using firm and consistent pressure, push down on the boot of the tip. The boot will push the welding rod into the substrate. If you choose to, once the welding rod adheres to the substrate, you can let go of the rod and it will automati­cally pull itself through. Most thermoplastics are sandable and the strength of the weld will not be affected when sanded. Using 60-grit sandpaper, sand off the top part of the welding bead, then work your way up to 360-grit wet sandpaper to get a clean fin­ish. When working with polypropylene or polyethylene, it is possible to regain their glossy surface by lightly heating the surface with a yellow open flame propane torch. (Keep in mind that nor­mal fire safety procedures should be fol­lowed.) Once these steps are completed you should have a weld that looks simi­lar to the photo at bottom left. Keeping the above tips in mind, welding thermoplastics can be a fairly easy process to learn. A few hours of practicing welding will give the “feel” for maintain­ing the right even pressure on the rod straight down into the weld area. And experimenting on different types of plas­tics will help master the procedure. For other procedures and standards, contact your local plastics distributor.